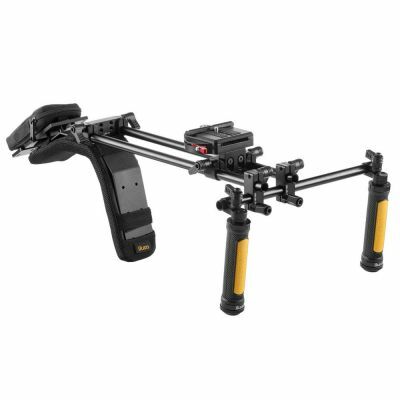 The Elements EV3 Flyweight DSLR Shoulder Rig features Ikan's new EV3 Quick-Release Baseplate System for use with small DSLR, mirrorless DSLR, and micro 4/3 cameras, and small camcorders. With no offset, the EV3 Flyweight's straight rig design is perfect for cameras with flip out screens. The straight design is also well-suited for camera operators who like to use external monitors or EVF systems. The EV3 baseplate system enables you to quickly and efficiently mount and dismount your camera - simply press one lever and the quick-release button. The Anti-Rotation plate prevents your camera from rotating out of alignment. The height of the EV3 baseplate can be adjusted to adapt to different cameras. Four 1/4"-20 and four 3/8"-16 thread holes line the bottom of the tripod mount for various mounting options. The unique shoulder pad gives the EV3 Flyweight Rig a comfortable point of contact with the operator's chest. This allows the operator to get a better feel by pushing the rig against the body.